Owls as Pets - My Child Wants A Harry Potter's Bird! The first issue with keeping owls as pets is their eating habits. Many young boys might think watching an owl eat would be cool. They wouldn’t be as excited about what they do later. Owls need to eat on a daily basis, and they need to eat small animals, whole. This is what they eat in the wild and you’ll never convince them to become vegetarians. Because an owl’s digestive system cannot process hair and bones, within a few hours of eating owls regurgitate the hair and bones of recent prey. This comes out inside a pellet that resembles feces in look and smell. No little boy, or girl, wants to clean those up. When looking for birds of prey for sale some may not realize that these birds, often referred to as raptors, have large and incredibly sharp talons. These talons are how they catch prey. So keeping owls as pets will require large gloves and arm protection for handling. Owl beaks are also razor sharp and even a small nip can cause a serious cut. Many professional bird handlers are known to have extensive superficial scarring from these built in bird weapons. 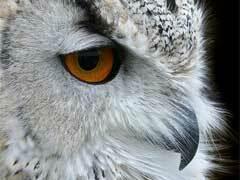 Owls and other raptors have aggressive temperaments, making their actions difficult to predict or control. Anyone advertising barn owls for sale should be approached with skepticism. In most states it is illegal, with few exceptions, to take a bird from the wild to breed or keep as a pet. Chances are, either you are buying a baby parakeet or falling into another scam. The best way to keep owls as pets is to build them an outdoor home and hope they move in. Many outdoor decorative bird cages and boxes can be purchased for just this purpose. If you have an open barn with a rodent problem your chances of finding a tenant are far greater, and you’ll get free pest control.